Detect inadequate retention force in seconds without disassembling drawbar. 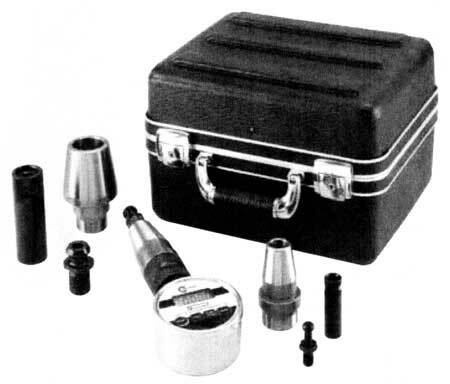 Modular Components fit most machining centers. Maximize tool life, spindle life and system rigidity. For all 30, 35, 40, 45, & 50 steep taper machining centers (requiring retention knobs) and HSK50A, HSK63A, HSK100A. Provides accurate drawbar force measurements on steep taper (CAT, BT, DIN, etc.) and HSK machining centers. Verifies the machine's drawbar performance against the manufacturers' specifications or from readings taken when the machine was new to ensure optimum cutting tool performance. Fast Performance Quickly identifies if retention force losses are at fault when poor surface finishes appear or when tool performance deteriorates. Services Entire Machine Shop A compact load cell with an electronic display and a family of taper adaptors combine to make a single measuring unit that can service an entire machine shop employing a variety of machining centers. Operation is fast and easy. Simply attach the taper adaptor and retention knob adaptor, screw in a retention knob, and install it in your spindle like an ordinary toolholder. The load cell is stretched by the machine's drawbar. This stretch is measured electronically and is instantly displayed on the digital readout. Spring deterioration or maladjustment can be detected in no time. No costly disassembly. No machine downtime. Operates on two 9 volt batteries for up to 1000 hours continuous operation. Calibration data is stored on a non-volatile memory. Standard calibration is 0-10,000 pounds. Can be custom calibrated. Call for quote. Re-Calibration and factory re-certification service is available. Turn around is typically only 48 hours. There is no bench charge if the unit is not repairable. 1 The pull studs can be any style to match your machine. You can use pull studs that you already have. The thread must match you pull stud. type A, E, or F.
The dynamometer is supplied in a foam filled carrying case. If you have a large number of different pull studs in your shop, there is a pull stud adaptor pallet that will fit into the case.